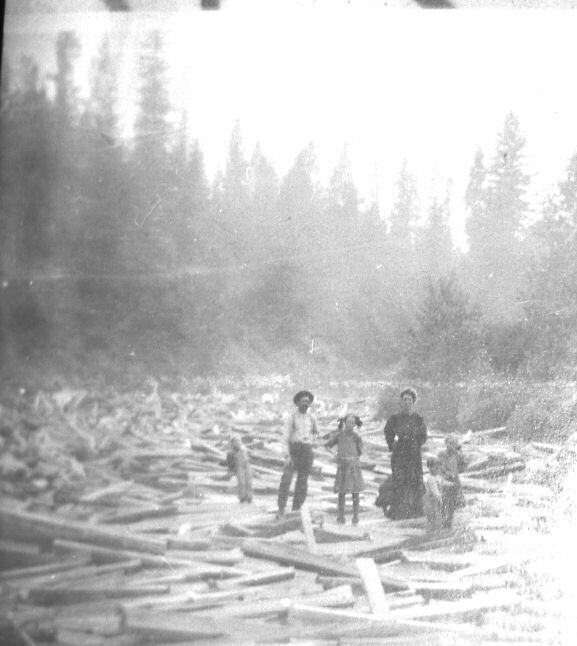 Logging cedar poles and making cedar posts were the backbone of the economy in the Clark's Fork and Bull River valleys. Whatever affected forest work affected the majority of families living there, one way or another. In 1928, the industry turned into a nightmare struggle of survival. "First I bought the timber off NPRR. I logged, but didn't cut the young timber down," Cliff Weare said. "I was afraid of cuttin out. The railroad land man come along. I knew him pretty well. "'I want to sell you that half section we got there,' he said. "'Well, I don't want it,' I said. "I couldn't sell anything. I had to sell all 80% whitepine. The land was mostly gravel, some good land, too, you know. "'You left a lot of good timber on there yet,' he said. "'Make me an offer on it anyway,' he said. "Well, I'll give you a dollar an acre." "I don't think they will either. If I'd a thought they would, I wouldn't a made that big an offer. Hahaha. "By gosh, pretty soon they sent me a letter saying send us $320 and we'll send you a deed to 320 acres."1. Investment in land seemed like a good idea in 1924-25, but as America slid into a financial slump in 1928 money became increasingly tight. The greater portion of Sanders county homeowners got behind in property taxes. Weare was no exception to lack of cash. Four months behind in car payments and with the NPRR still demanding the rest of their timber trespass money, two pieces of Weare's timber property in Bull River have delinquent taxes. NE1/4 Sec 16/T28/R33 and W1/2W1/2 Sec.11/T28/R33 for the years 1924 and 1925.2. Winter snowfall settled in around buildings and buried equipment, but nevertheless, loggers continued to work in the woods. Courtesy Harry and Sarah Tallmade collection. Weare had over 36,580 feet of cedar poles on hand. Page & Hill Company, a Spokane, Washington firm, sign a contract January 16, 1928 with Weare for western cedar poles. As soon as the snow goes off the poles, they'll send up an inspector. "We trust this deal will be the start of a considerable volume of pleasant business relations between us." 3. A check of the poles late in March indicate, "Poles should lose considerable moisture" before shipment, making them lighter to ship, of course.4. 151 poles were shipped in April from Weare's supply; for which they paid $850.45.5. Bull Lake in Lincoln County, Montana. Weare always read his newspapers, taking an intense interest if world affairs. When U.S. submarine, F-4, was sunk off the coast of Honolulu, Weare was furious. (Wikipedia, USS F-4, http://tinyurl.com/5vdxl6c.) It was the second submarine disaster he'd read about recently. He immediately got out the design and model of a device he felt could save lives, that he'd made up during WWI. He sent the detailed drawings and a scale model along with his letter to the War Department of the Navy. "I was going to patent the device, but I heard that such a device was already in use. But since the last two disasters I know that no such device is on our submarines or they could not be lost..."6. "... regarding your idea of a buoyancy tank as a safety device for submarines, the Department thanks you for your communication and your desire to be of service to the Navy in an effort to solve the serious submarine problems now under consideration. This office has recently received several thousand communications on the subject of safety devices for submarines and salvage of sunken submarines."7. "the Board did not recommend the adoption of your suggestion for reasons that are given in the report ..." The Board was returning all descriptions, drawings, and models that he "so kindly submitted" and also thanking him for his "live interest in the Navy's welfare and the patriotic spirit manifested by you."8. Undaunted by one rejection, Weare sent the required Government Filing Fee of $50 to Carl H. Crawford, patent attorney in Spokane, Washington, seeking to patent an irrigation mechanism.9. Weare is on the go so much he has difficulty following up on a timely basis with every commitment he makes. Spring arrives with snowmelt, blue skies and skunk cabbage poking brilliant yellow blossoms in advance of green foliage. Frogs croak courting calls in dusky nightfall. Log decks at Bull Lake, Lincoln County, Montana. 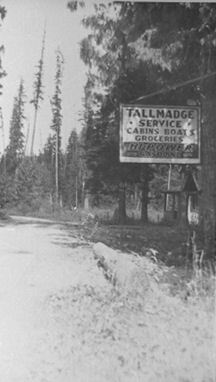 Harry Tallmadge and sons ferried them across Bull Lake, to be trucked to the railhead in Troy, Montana. Sarah Tallmadge and daughters pose beside the poles. Courtesy Harry and Sarah Tallmadge collection. 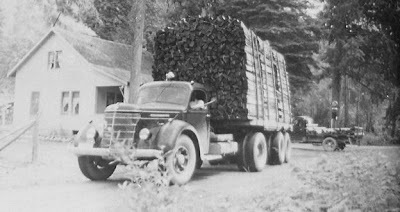 Harry Tallmadge took this picture of his truck, loaded with hand split cear posts heading to market. Taken at Bull Lake, Lincoln County, Montana in the upper Bull River valley. Courtesy Hayy and Sasrah Tallmadge collection. This truckload of hand-split cedar posts is heading out of the Bull River valley, via Libby, Montana, to be shipped on the Great Northern railroad to markets in the east. Courtesy Harry and Sarah Tallmadge collection. "We heartily agree with you that it is a fright the amount of rain we have had... during the last couple months...those poles at Noxon should not be shipped until we have had quite a little stretch of good hot drying weather. "Note you could use a little money to advantage. Demands on us for money have been awfully heavy the last week to 10 days." But they send $1,000 and promise more if Weare gets up against it before they ship out the poles.10. Throughout 1928 poles remained a mainstay of the valley's economy. 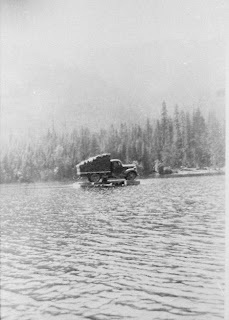 Hitchner & Hitchner, Inc., Sandpoint, inquired of Weare about some poles he had at Smeads, wanting to buy them.11. Stone E. Paulson, Belt to Tiger Butte Telephone Co, inquired about prices for telephone poles delivered to Belt, Montana.12. P & H accepted carloads of the long, straight poles, to a total of $4,827.00 on the contract with Weare. Prices on them ranged from a low of $2.00 for 6"-30' poles to a high of $9.10 for 8"-65' poles. All poles had to meet official manufacturing specifications for western red cedar piling.13. "Please do not delay shipping the order as we need them badly."15. Valley Meat Market, Hot Springs, Montana wants cedar post quotes, too.16. 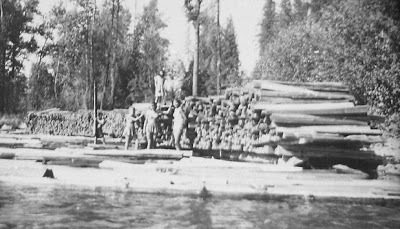 Summer's harvest is complete across Montana when requests arrive from Alois Raunig, Stockett, Montana for prices on cedar posts. H. E. Reed, Florence, Montana, Krook Bros, Boyd, Montana, Geo. Lode, Harlowton, Montana, and C. E. Hetts, Stanford, Montana, also inquire. Lode ordered a carload of posts shipped to Oka, Montana.17. Seeking ways to make some money Weare asks from Representative John M. Evans to get him a list of Farmers' Bulletins and Leaflets put out by the Dept. of Agriculture, which he studies night after night. In anticipation of the tourist trade he believed would come once a highway was built connecting the valley with Idaho, Weare planned the first gas and service station, with cabins and tourist facilities, on the Montana side of the border. He envisioned a two-story cement building, built to last. He ordered in 100 sacks of cement ($120) from W. S. McCurdy Lumber Company, Thompson Falls.18. To strengthen the cement walls of his service station, Cliff drove around the countryside, and hauled home loads of scrap iron he found lying about on abandoned properties, or discarded by various settlers - old bedsteads, stoves, etc. He cleaned up a lot of trash that way and put the scrap to good use. Noxon-Thompson Falls Rod and Gun Club, recently formed, offered National Rifle Association members the opportunity to buy surplus rifles from the War Department.19. Weare wanted to buy another Krag rifle, but he'd already bought one in June so he couldn't get one. Instead, the War Department returned his Money order for $1.50 and his National Rifle Association of America membership card.20. 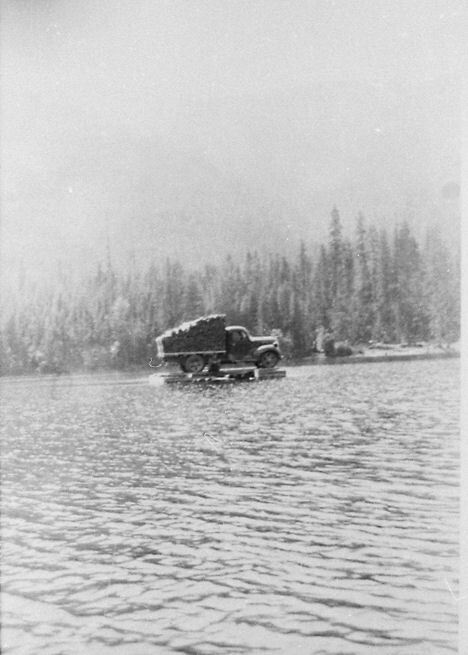 "I had logging camps on Bull Lake, one at the North Fork, and one up on Section 15, about two miles up the creek," Weare said. "I had three camps, twenty five to thiry men in each camp. Just logged in the winter time, with horses, you know."21. The barter, or credit system, used in the timber industry of the Pacific northwest seemed to produce an endless amount of disagreement. The idea of 'You work, I'll pick up your store credits,' system produced continual squabbling over who owes who for what. 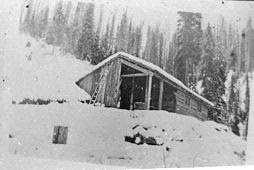 Weare is in a squabble again the spring of 1929, in Libby, Montana over Pallmers claims. Cliff is involved when Charles W. Runyan sued Theodore Pallmer for $101.00, getting an attachment filed on Pallmer's personal property when he's served notice of Garnishment of Pallmers wages.22. Trying to protect Pallmer, as well as himself, Weare send a note off to Pallmer to move out of the Bunkhouse he has taken possession of. "You and family can have bedding and quarters in the other buildings tonight and tomorrow move to Tallmadge's with your things. I believe these arrangements are better for all and that way, there will be no chance of arguments in regard to rent and ownership of property. Send someone after your stuff." If Pallmer filed a lien on the posts, they can't be sold or moved while the lien is on them. A foreclosure of a lien is much like the foreclosure of a mortgage. The dealings, as usual, get mired up in skullduggery. "I received your letter this morning in which you, to my astonishment, asked if I had authorized a Mr. Palmer (sic) to commit the crime of larceny. "Your belief that such a thing was possible from this office is nothing less than astounding. You have got the wrong idea of this office. It is with some pride and a great deal of emphasis that I inform you that this office has never authorized anybody, at any time or place to violate the criminal laws of the state of Montana. "If Mr. Palmer (sic) took any property belonging to you, he did so without the knowledge, advise or consent of this office. Even if you had owed him a million dollars and I knew it to be true, I would advise him not to touch your property except by due process of the law." "... his lien does not seem to be very good. He can put a lien on only for work done during the three months preceding the date of filing the lien, which was Mar 4, 1929, but he put it on for a period between the 12th of April, 1928 and 14th of February 1929 ... as I remember the case, you have paid him more than he has coming." 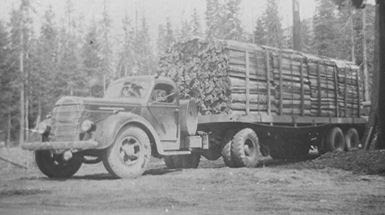 "several cars of 6" 25' cedar poles that can be shipped through Sandpoint and treated here and forwarded and a car or two of 6" 20's, seasoned stock."24. "Posts from the coast are more lasting than those east of mountains as the timber is larger, mature, therefore growth more dense. Proven in common recognition that our shingles are much better than those made east of the mountains." "We are well satisfied with the fence posts we ordered from you and all the count is in the car. If you have some more posts left we might order another car during the summer. Let us know whether you have any post left."27. Weare bought cedar stumpage from NPRR on Sec.15/T26N/R33W.28. Throughout the summer season orders for cedar posts held up well. Mineral exploration wasn't completely on the back burner yet. Men were still prospecting and hoping to bring financiers in to develop likely deposits. And Clifford Weare was keeping a sharp eye on the situation, wishing he didn't have so many irons in the fire and could spend days exploring the rugged peaks and do a little prospecting of his own. Driving back and forth to his logging camps in the Bull River valley, he took in the fractured mountain formations bordering miles-long stretches of the road he bumped over. Great slabs of rock canted crazily on steep slopes, an indication to him that tremendous forces had at one time shifted the earth's crust. Who knew what wealth lay waiting to make a man rich? "More than five feet of lead-silver ore of good grade was revealed recently by a crosscut on the property of Angell, Fewkes and Hosea, near Bull Lake, according to A. F. Powers, mining engineer of Troy, Montana." The discovery was regarded as important. Powers, manager of the Liberty Metals Mine, said there "was much activity in the Troy district."29. "I may try for a new trial in your case if for no other purpose than just to save you the $100 costs, for which they have filed a cost bill against you, which would be set aside if we got a new trial. What would you say as to a new trial? "Look out for Williams and settle with him as he was a good witness in your behalf; perhaps if you would come to Thompson Falls and see him personally you might settle it a little cheaper with him but do not forget him ..."
Weare had subpoenaed Mr. G. C. Williams, Mr. Olver and Mrs. C. R. Weare as witnesses. Williams billed Weare expenses of being a witness: $9, board, $30 mileage from Spokane, 5 days lost wages @ $5.60, $28. While he was at the courthouse, Weare paid up all his back taxes, redeeming five parcels of his land that had sold for delinquent taxes January 2, 1926. At Parks' urging, Weare is going for the new trial, calling Manicke to testify and adding a few things about Gordon.30. Meanwhile, McGoldrick Lumber Company, will get a man over to cruise Bonners Ferry timber land Weare wants to log,31 and J. Neils Lumber Company, Libby, Montana offers $20 per M feet for white pine logs cut from live green timber, loaded on cars at Troy, Montana.32. "... if satisfactory I can furnish you, in all probability, with as much of a market for your stuff as you will want."33. Mission Valley Farmers Assoc., Moise, took another car load of 1700 posts, counting them 1638, and taking two months to pay for them.34. Oliphant writes he has orders "for 3 carloads in sight and the 4th one started", but reports one buyer thinks the price for 7"7 ft. posts is too high. He'd take a carload for 12 cents. How many of the bigger ones are in a carload? 35. In addition to shipping carloads of posts, Weare is taking out poles at Troy under contract for P&H.36. But his checks are bouncing because credit drafts on companies he's doing business with are being processed slowly at the banks. Money is hardly moving in the country.37. Taxes for 1929 are delinquent, about $145.00. Weare's house is in his wife, Ethel's name only. "This is to acknowledge receipt of proof of claim filed by you in the amount of $205.80 against A. C. White Lumber Co.
"On April 11, 1930 Judge Cavanah signed a decree in the Federal Court at Boise, in the case of Equitable Trust Company et al, V.A. C. White Lumber Company et al., which, among other things, allowed claims similar to yours as general claims against A. C. White Lumber Co."
"May 13, 1930 at 10 o'clock A.M. in the Federal Court room at Moscow, Idaho." The mill property is in the hands of receiver L. S. Franck.38. The closure of the sawmill on Lake Pend Oreille sent shockwaves throughout the timber industry of Idaho and western Montana. But men still needed work. Weare, having cast himself in the role of a major employer, continued to explore the market. Men still employed by him in post and pole making included McDonald, Jim Siegert, E. Snyder, Matheney, Bill, and Harry Tallmadge. Cliff was working long hours also, making poles and rounds. "the posts does not look very good to me. I have not gat (sic) no market yet. Larson's said he don't want them. How about getting out that white pine over east near the trail to the mine? There must be a couple of carloads. If you want it out, give me a reasonable price to put it on the road, or how much per thousand you will take for it. It would help out."39. "and see what we can work out. "Business is awfully quiet and the prospects for the balance of the year are not too good. We are therefore not anxious to buy or contract any additional poles at the present time. "However, if the little bunch of 200 poles that have been offered to you over there are A#1 quality stock and you can buy them at a price that will net you a nice little margin we would be glad to accept them if Hill, Minneapolis Office is pushing him for reports ..."40. Weare managed to get small contracts with P&H and continue logging throughout the summer. Soft road conditions hampered hauling considerably, and he bought a 1 1/2 ton Ford truck. "were working on the road over there and it might be some little time before you would be able to start hauling. We were in hopes that you would be able to get those poles trucked into Troy during the present month. Isn't the road in shape..."
"[P&H] Poierier won't be back from Canada to haul until about the 23rd or 24th. Give us advance notice when you "will be ready to load so that we can notify him."*41. P&H urgently needed to know how many poles Weare has, in the woods and out, and their sizes.43. Just as school started, Weare is finally hauling again, " ...last Saturday, and got in three more loads Sunday." P&H has an order of 75' poles to fill, and have a calling for 21 pieces of 75's and 4 pieces of 80's. "Poirier will load out all the 40's at Troy, but might have to keep 35's and shorters decked some little time. Put them on good skids.44. June 8, 1930, $783.50 credited to Weare. September 16, 1930, 30 poles - $443.15. B.J. Carney & Company, Sandpoint, ID the destination. September 18, 1930, 103 poles - $945.60. September 20, 1930, 93 poles - $665.25. Profits blew with a tire and tube costing $31.18. P&H sent Weare the laborer checks for loading poles at Troy; "... made out on the percentage each man is entitled to, or about 73% of the payroll amount in each case."45. "… which we hope will tide you along until you get some more poles in the yard. Your account is now about $500 over what you are entitled to on poles delivered. Wish you would tear right into it and get the balance of the poles in the yard before the roads become too muddy to haul."46. The entire timber industry is severely stressed, financially, and on the verge of a total collapse. P&H hasn't heard from Weare in a month. His last report gave a list of 145 poles hauled in to Troy as of the first week of Oct. They need to know if "you have now cleaned up and hauled to Troy" all poles in the woods.47. "In looking up contract we made with you last year find that it provides that delivery be completed at Troy on or before June 1, 1930. While we don't need the poles and we could have replaced them any time during the last few months at a whole lot less than the prices we were paying you, we will accept under our contract with you dated September 12, 1929, all of the poles that have been hauled in and are now on hand at Troy, Montana that will pass for No. 1 stock under the terms and conditions of the contract. "However, this will notify you that we do not want and cannot accept the balance of the poles you still have left in the woods. "The market at the present time is frightfully weak and the prospects for poles for next year are not good. However we will try to line up with you later on some kind of a new deal for the little bunch of about 200 poles you have left in the woods."48. Weare will be in default January 17, 1931 on NPRR contract.49. The $25 L. D. McFarland paid for the rent spur yard for 1930 was a godsend. "I quit logging. Just when the depression hit. I couldn't go any further. Old White died. I was logging for him. And he owed me $17,000. I never got a nickel out of it," Weare said.50. 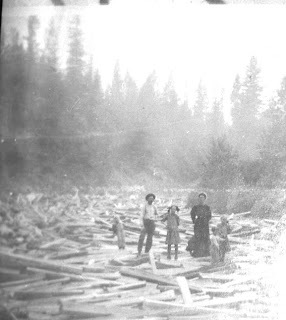 Maurice McKay said, "We were doing all right until the depression came along and then the big Humbird Mill in Sandpoint closed and we had been relying on that to buy a lot of our timber. Just everything all up and down the line went broke because there was no market."51. Clifford R. Weare, tape-recorded oral history June 28, 1973. Clifford R. Weare papers, January 18, 1928. Clifford R. Weare papers, January 16, 1928. Clifford R. Weare papers, March 24, 1928. Clifford R. Weare papers, April 14, 1928. Clifford R. Weare papers, 1928. D. E. Theleen, Captain, U. S. Navy, Secretary of the Navy Inventions, War Department, letter April 18, 1929. Clifford R. Weare papers, January 1, 1928. Clifford R. Weare papers, July 10, 1928. Clifford R. Weare papers, January 31, 1928. Clifford R. Weare papers, November 21, 1928. Clifford R. Weare papers, September 24, 1928. P&H took 127 for $804.05; (9/26/28) 139 for $802.70; (9/29/28) 154 poles, $754.95; (10/6/28) 153 poles, $805.60; (10/11/28) 151 poles for $809.25. Clifford R. Weare papers, December 12, 1928. Clifford R. Weare papers, April 17, 1928. Clifford R. Weare papers, April 13, 1928. Clifford R. Weare papers, var., October-November, 1928. Clifford R. Weare papers, November 30, 1928. Rifles offered for sale to NRA members included: U.S. Rifle, cal. 30 Model 1898 (Krag), $1.50 a five shot magazine rifle with 30" barrel; Rufle, U.S., cal.30 Model 1903, $32.75-$40; Russian Rifle, cal. 7.62 mm., new, $3.34; Rifle U.S., cal. 30, Model 1917, $35.40. All 5-shot, clip loading. Clifford R. Weare papers, October 13, 1928, from the War Department, Director, Civilian Markmanship. Clifford R. Weare, tape recorded oral history June 28, 1973. Clifford R. Weare papers, March 12, 1929. Clifford R. Weare papers, April 20, 1929. May 22, 1929 (1) to Harlowton Meat Co; May 18, 1929 (1) to E. J. Wight, Hall, Montana; June 7, 1929 W.M. Kenny, Moise, Idaho. Clifford R. Weare papers, April 9, 1929. Clifford R. Weare papers, April 30, 1929. June 10, 1929 NPRR notice indicates they sold stumpage to Weare on contract #15792. Stumpage prices quoted were White Pine saw timber, $3.00 per M bd. ft; Yellow Pine, Larch and Red Fir, $2. ; other species, $1; #5 ties, 6 cents; #1-4 ties, 4 cents; green cordwood, 50 cents a cord; dry cordwood, 25 cents a cord; cedar poles 20'-25', 1/2 cents per linear ft; cedar poles 30' and longer, 2 cents; cedar split posts, 1/2 cents each; cedar round posts up to 8' long, 1 cent; cedar posts 8'-18' long, 1/4 cent per linear ft.
Sanders County Independent Ledger, May 29, 1929. Clifford R. Weare papers, var., 1929. Clifford R. Weare papers, July 20, 1929. Clifford R. Weare papers, August 19, 1929. Clifford R. Weare papers, January 17, 1930, Frederick D. Whisler, Union Insurance Society of Canton, Lmt, Taxes are delinquent again. $4.60, interest of 12% until paid. Clifford R. Weare papers, February 28, 1930. Clifford R. Weare papers, March 1, 1930. Clifford R. Weare papers, March 4, 1930. Clifford R. Weare papers, May 3, 1930. Clifford R. Weare papers, May 8, 1930. Clifford R. Weare papers, undated, 1930. Clifford R. Weare papers, May 24, 1930. Clifford R. Weare papers, June 19, 1930 and June 1930, var. Clifford R. Weare papers, July 23, 1930. Clifford R. Weare papers, September 4, 1930. Clifford R. Weare papers, September 9, 1930. Clifford R. Weare papers, September 24, 1930. Clifford R. Weare papers, September 29, 1930. Clifford R. Weare papers, November 3, 1930. Clifford R. Weare papers, December 2, 1930. Clifford R. Weare papers, December 17, 1930. Clifford R. Weare, tape recorded oral history March 10, 1972. Ruth Tauscher McKay and Maurice McKay, tape recorded oral history, var. John and Maurice McKay attended the University of Montana. "Dad moved to Spokane in 1930 and the family moved in 1931." WOW! This is amazing! I am sitting on Bull Lake right now. Thank you! The most amazing country I've ever seen! Glad you liked it. Own your copies of recently revised and expanded Volumes I and II. Watch for Vol. III on Kindle, too, coming this year.